Blindside Poidevin grew up playing rugby in New South Wales and made the Australian schoolboy side. After impressing for the University of New South Wales, Poidevin earned a call-up to the Waratahs side. He went on to make his debut for the Wallabies on March 24 1980 against Fiji and accrued 59 caps for the national side - becoming the first Australian to play 50 Tests in the process. He also captained the team on four occasions. He played in the 1987 World Cup and despite Australia being knocked out in the semi-finals to France - he put in an impressive shift in the Wallabies back-row. Prior to the tournament he lined up for the Australian Sevens side during which time he took the prestigious Hong Kong Sevens. However his finest hour came in the 1991 World Cup Final against England where the blindside played a key role in Australia's 12-6 win in what turned out to be his final appearance for the national side. 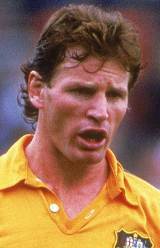 After retiring from the Wallabies in 1991 - Poidevin moved into stock broking though maintained his links with rugby through working as a commentator for Australian television. In 2011 Poidevin was honoured by the ARU and named a Wallabies Statesman.